MICHEL Barnier tonight warned Britain he is in no mood to make concessions during the Brexit talks, saying the UK would have to pay the "substantial consequences" of its decision to leave the EU. The usually cool-headed Frenchman showed flashes of anger as he was asked what concessions he had been prepared to make to his British counterpart David Davis during a frantic opening day of talks. In response Mr Barnier, who is the EU's chief negotiator, launched into a furious tirade against the Brexit decision but also insisted that the rest of Europe had no desire to "punish" the UK for choosing to quit. His outburst came at the end of an evening press conference which began in more jovial fashion, with the pair announcing great progress had been made on the structuring of the talks and citizens' rights. Mr Davis in particualr was keen to portray the first salvo of the talks as highly constructive after earlier telling reporters that Britain and the EU had "more that unites us than divides us". 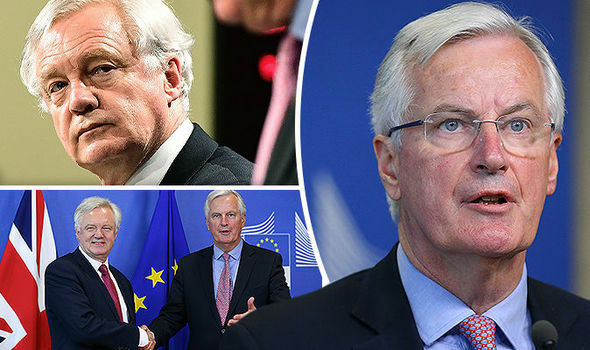 But the Brexit secretary, who faced a volley of tough questions about the political chaos engulfing the Government back at home, was introduced in a brutal way to Mr Barnier's steely resolve not to budge from his negotiating mandate handed down by EU leaders. Asked what concessions he was prepared to grant the UK, the Frenchman raged: "The UK has decided to leave the EU, it’s not the other way around. The UK is going to leave the EU, the Single Market and the Customs Union, not the other way around. "So we each have to assume our responsibility and the consequences of our decision and the consequences are substantial. It’s not about punishment, it’s not about revenge. "Basically we are implementing the decision taken by the UK to leave the EU and unravel 43 years of patiently built relations. I will do all I can to put emotion to one side and stick to the facts, the figures and the legal basis. " 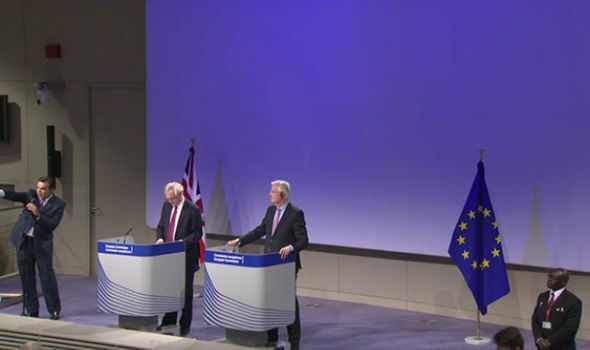 Moments before Mr Barnier had expressed his determination to reach a "fair deal" with the UK and once more laid into claims by Theresa May that the British side could walk away from the talks. He told reporters: "A fair deal is possible and far better than no deal. That is what I said to David today, that is why we will work all the time with the UK and never against the UK. There will be no hostility on my side, I will display a constructive attitude firmly based on the interests and support of the 27." But he warned the UK against expecting some kind of special status outside the EU, saying it would be in the same position as any other third country looking for ties with Brussels. He said: "There are different forms of cooperation between the EU27 and third countries and in all those scenarios you have to weigh up the rights and the implications, the conditions and the UK knows what the rules are for each of those models." The Frenchman said he was "neither optimistic nor pessimistic, but determined" at the outset of the talks, adding that Britain will "no longer enjoy the same rights and advantages of EU states". His forceful defence of the EU's unshakeable negotiating position provided an early demonstration of the monumental task facing Mr Davis, who in contrast tried to strike a more optimistic tone in his remarks. The Brexit secretary said he had been "encouraged by the constructive approach both sides have taken" on the opening day of Brexit and revealed he and Mr Barnier have already laid down a detailed framework for the talks. But in doing so he was immediately forced to fend off accusations that he had caved into Brussels early on after Mr Barnier announced that the UK will follow the phased approach to the negotiations drawn up by eurocrats. And questions were also raised over how seriously the two parties were taking the Northern Ireland issue after it was not afforded the same technical status in the talks as other aspects, accusations both men forcefully rejected. "Nowhere is this more true than on the important issues around the rights of citizens where I’m happy to report there is much common ground. On citizens we hope we can get a reasonably fast settlement. "My first priority is to provide certainty to EU citizens living in the UK and to UK citizens resident in the EU. Now that the negotiations have started we’re determined to get on with the job and deliver that certainty as soon as possible." He added: "Today marks the start of a journey for the UK and the EU. There’s a long way to go but we’re off to a promising start, we’ve taken the first critical steps together. Now we have a shared responsibility to secure quick and substantive progress. "There’s no doubt that the road ahead will at times be challenging but as Winston Churchill once said the pessimist sees difficulty in every opportunity the optimist sees opportunity in every difficulty." On the structure of the talks he insisted the Government had not performed a climbdown because it will not fully sign off on the technical aspects of the divorce until the framework for a future relationship is in place, telling reporters Mrs May's position "hasn't change" on the issue. Does not sound promising. Depends who needs the connection the most. 1. The UK´s coalition partner are raising objections. 2. The loosing Labor party is enticing people to revolution. 3. The Remainers of the Conservative party is plotting to steal the PM position. 4. PM Theresa May is given the blame for EVERYTHING in order to oust her. 5. The same for President Trump,who also gets blamed for everything. 6. The European Union has signed the TTIP trade agreement,and as the UK is still a EU member,it can be sued for obstructing TTIP's business plans and profits. TTIP's Court have precedence over all other courts for signed members. There are already many countries sued for trillions.